We arrived back in the UK and returned to Hertford. We spent the next two weeks catching up with friends and family and buying our LandRrover which is to become our new method of travelling. It is a Defender 110, with a tent on the roof rack and kitted out for an African trip. It has actually just come back from a trip to Durban, South Africa. Africa here we come, and all other warm places, as I don’t fancy my chances in the cold with it. Ray and I drove the Land Rover and Lizzie up to the farm in Scotland. We had a good journey and arrived in the afternoon. For the next two weeks we spent the time emptying Lizzie and cleaning her inside and out. I use the term we, but it was really Ray who polished and spruced her up for sale. We have got storage up in Scotland and have packed away all the gear that apparently is going to be surplus to requirements whilst travelling in the Land Rover. I have managed to purchase a few goods that have found their way into storage, (unbeknown to Ray), for when we finally settle down. I don’t care that they may be out of fashion by that time, I like them. We have had four family birthdays to celebrate so have had some nice meals out and I was particularly spoilt on mine. We also took Mum to see the new Pirates of the Carribean. Not only was it not very good, we all looked daft wearing 3D glasses. Ray set off on his trusty steed, Wallace, and went down to Derbyshire for the Horizons Unlimited weekend. I’m only getting little bits out of him at the moment, but as I understand it, a great time was had by all and lots of Abbot was drunk. Horizons Unlimited is an adventure bikers meet where bikers from all over the world get together and talk about travelling the world and the problems encountered. One of the most amazing things is the amount of women who tour solo to places most blokes won’t go. It is in the grounds of a big pub which was well used! Mum and I went down to Annan on Saturday 25th and visited a Scottish pipe band competition. It was wet and wild and the weather wasn’t much better, but it was fun, and I have never seen so many men in skirts. “Freedom.” (That’s a quick quote from Braveheart). Lizzie has been put up for sale now and it is quite sad, we have had some marvellous times in her. We haven’t named the Landrover yet, but it has been sworn at quite a bit, and needs a few things doing to her. Ray is off again, on his way to London, he has taken the Landrover, towing Wallace, as he is going to drop the jeep back with the people we bought it from for a sort out. From there he is off to Spain and Andorra on a week long motorcycle orienteering competition. No doubt he will fill in the gaps for that one. I had volunteered to help out at are local Tesco’s collecting for the Help for Heroe’s charity and was asked to cover between 12 and 2pm. However, no sooner had Ray left that morning than he had been phoned by a chap who wanted to view Lizzie. Our mobiles don’t really work at the farm and unfortunately on that morning also, the home phone packed up. Anyway, there I was accosting customers outside Tesco’s when a bloke asked if my name was Karen. I think it’s obviously a throwback to the Police, but I immediately wanted to say no and on deciding I couldn’t remember him, didn’t know whether or not I liked him, owned up. Turned out, he had contacted Ray who had told him where I was and then he was following me out to the farm to have a look at Lizzie. Keeping fingers crossed. Being a girl, I’m not very good at the technical stuff on Lizzie, I kind of think I’ve left everyone a bit short with details, but luckily she spoke for her self in other ways. I was contacted by one of our old colleagues from London who was in Dumfries and wanted to see the motorhome as well. We had a good old chinwag and catch up, both deciding that retirement was the way forward. Left at home to my own devices, my Mum and I have been gallivanting around Dumfries and Galloway, spending Ray’s pension and doing all the things we haven’t been able to do with us abroad and away so much. For a change, the weather has been lovely, so Mum and I went to Caelaverick to the wetland centre. When Ray and I had last gone there, it was very dry and should have been so named, today it had water but very little else, although we could watch an osprey nest, complete with chicks and barn owls via a camera live feed. The walk was lovely and I would recommend it. Ladies day out again, family get together, very enjoyable. Having set off from Scotland in the Land Rover towing Wallace, I dropped the Landrover off on Harlow and got on Wallace and set off for Spain, on the way collecting a colleague from the south of England. There should have been 3 of us but one, Jason, crashed his bike a week earlier and died at the scene. Anyway after a trip to Plymouth, a 2 day ferry crossing, where we met another guy on the boat and another long, 2day trip across Spain we finally arrived at a place called Llavorsi, on the border with Andorra. We had overnighted at a small B & B which was brilliant. We sat down to eat with all the hosts family and despite not speaking French and having to change 2 tyres, we had a great evening. We booked in for our 3 day cross country orienteering event on bikes which was actually called “Mountain Madness” and were issued with our maps and checkpoints. We set off that afternoon and we thoroughly put the bikes through their paces. Richard kept falling off and I had to rescue him several times. This was despite me being on a much heavier bike. Throughout the whole 3 days I did not fall off at all which is testament to how good Wallace actually is. Found it, a small plate at the base of the post. We did not win by a long way but we came 6th out of 12 in our class (big bikes). This was mainly due to the fact that Richard could not keep up – sad but true. The way home was interesting. Before leaving I let Grant Johnson have a go of my bike. He is the event organiser and is considering changing his BMW for a Yamaha. Anyway, when he arrived back I noticed that the rear tyre was flat so we decided to plug it. Unfortunately, about 40 miles from the ferry, the plug came out and I had an instant flat. Not funny at 60mph on a motorway. I re plugged it and rode slowly to the ferry via a short overnighter in San Sebastien, I pretty town on the North coast of Spain. I managed to dive between the cones and again repaired the tyre at the road side and eventually got home to Trula’s house without further problem. The next day I collected the Landrover, put Wallace back on the trailer and headed back to Scotland. Today Mum and I went off to Moffat. It is a beautiful little town and visited by lots of coach trips. The weather was pretty rubbish and on arriving in Moffat, we went into the woollen mill, we had only just got in there when the heavens opened, we struggled on with some more shopping, but the weather was just too awful to go for a walk about. We did go out in the car and took a trip down memory lane and visited the little village where we used to live, saw our old house and laughed about some of the dafter things we’d got up to. Aaaaah. A week later, Ray returned from Spain and bought the Landrover back. A lot of work had been done on it and it was running much better. Now begins the difficult part, trying to turn a really small rear cab into a spacious motor home. Whilst Ray had been away, I had made a few phone calls and arranged for a couple of weekends away, the first being the 16th of July where I had booked us into the Ramada in Crewe so that we could go to the BSB’s at Oulton Park. We travelled down on Wallace and got there late Saturday afternoon. The place was heaving with American tourists, so we stayed out of the way and got ready for Sunday. After breakfast, we set off in the rain to get to Oulton Park and got us there quite early. We wandered around the circuit and got progressively wetter. We bought a water proof shelter and a couple of little stools and we tried to stay a little bit dry. The racing was good but by mid afternoon the rain was so bad that the rest of the days racing was cancelled. We headed back to our hotel and had tea in the restaurant and watched what racing there had been, on the telly. Our second foray into the wilderness was on Friday 22nd of July. After a week of working on the Landrover, we took her up to Oban to catch a ferry over to the Isle of Mull. We had fantastic weather and our hotel was in Tobermoray, with a great sea view. I had arranged for us to go out on a boat trip on Sunday 24th, but Saturday was ours to do some sight seeing and exploring the Island. It is a beautiful place and the sun made it far more picturesque. Ray’s birthday today and after opening all his cards and having breakfast, we were at the harbour for 9 o’clock to board the boat. 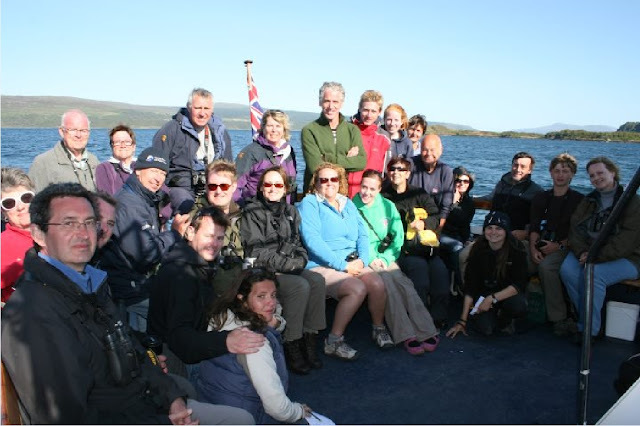 It was supposed to be a whale and dolphin expedition with the wildlife photographer Gordon Bucchanan. He was on spring watch and has done various other t.v. programmes. Although the sun was shinning, it was quite cool and the wind was quite strong making for lots of seahorses. We saw loads of different sea birds, but there was a distinct lack of whales and dolphins. Like a scene from "Pirates of the |Carribean"
Our boat trip party. Gordon Bucannan, the wildlife TV star is beside Karen. There were plenty of grey and common seals though. We dropped anchor near some tiny little Islands and were ferried over to them. Apart from the temperature, you could almost believe that you were on a tropical Island, it was beautiful. Gordon actually got into the water and was swimming with the seals, infact his were the only set of fins we saw until we got almost back to the harbour, where we glimpsed a fin off of a harbour porpoise. Although a disappointment in the sightings it was a good day, we then had a fabulous meal in the hotel and were to be up early again the next day, as we will be going out with a husband and wife team on a tour called discover Mull. We had a bit of a trek over the Island to reach our pick up for today’s tour and it is all single track road. We were driving in the rush hour and passed about 3 cars. On arriving at our destination we were met by a small mini bus and 6 other passengers and Pam and Arthur Brown who run the show. Pam makes all the sandwiches and cakes and soup for the day’s journey and Arthur was our driver/wildlife expert/comedian. It was a brilliant day and we saw two Golden eagles and two sea eagles, plus countless other species, unfortunately, today it was the turn of the otter to be very elusive. If you are ever in Tobermoray, I would highly recommend them, and Pam’s lemon cake is to die for. Can cows be cuddly ? It's a ferry....what did you expect...canoes ? We headed back to Dumfries and for the next two weeks worked on the landrover. We are considering calling it Gromit, as we have Wallace, who sadly for Ray is now in storage with the rest of our possessions. Our days were broken up slightly by my father. He bought himself a topper, which is a rather large attachment for his tractor, and cuts the grass in his fields. Off he went into the wild blue yonder and the fields were cut in a flash. However, Ray and I were outside working on Gromit and I thought it had been a while since I’d heard the tractor. We walked to the front of the house to the field where he had been cutting the grass, and saw him walking up the field minus tractor. Apparently he had hit a bit of boggy ground and had got the tractor stuck. We lept into action, grabbing Gromit and the quad bike, we went on mass to see if we could pull it out using the winch on the front of Gromit. The tractor was in deep, and was sinking slowly as we watched. We were unable to winch it out, infact Gromit was nearly there keeping the tractor company. In the end we had to phone a neighbour who had a huge tractor, and he pulled it free no problem at all. It made for a very amusing afternoon. On Saturday 6th August, after several major panics and wondering how little we could really carry in our new home, we set off to mid Wales to stay with Ray’s brother Bruce and his wife Lyn. Every year they hold what is lovingly called “Chill on the Hill” which is a BBQ arranged for their friends and fellow husky dog lovers. They set up a large white marquee and people travel from all over Britain to get there and camp overnight in the field. It was our first night for the roof tent and come the time for bed, it was blowing a gale and I bottled out and slept inside Gromit with the cat. Unfortunately when I needed to get out during the night, I couldn’t, and all the hammering on the roof of Gromit never woke a sole, not even Ray, suffice to say I have now taken up gymnastics and having climbed over the front seats, cupboards and bars to get out of the passenger door, I am ready for round two. Some days I feel very old and miss Lizzie. We ended up staying for three weeks. Again the boys worked on Gromit in between other jobs around the house. We took a drive, all four of us along the coast and ended up on another boat trip promising dolphins, and the rest. Not a one, de nada, zilch, but again it was good being out on a boat. Bruce and Lyn have 4 house dogs plus thirty something huskies, a couple of Leonbergers, two collies and a Rotweiler who reside in the kennels, oh and a horrible little hairy Jack Russell that they found abandoned. We slept in the caravan from the first night onwards, and this thing howled the night away. Karen fed the birds so much that they had trouble flying. It also makes them easy the photograph. They also very kindly left the marquee up so that we could work under it in all the bad weather. I was in the house busy with something, when I looked out of the window and kind of absent mindedly thought, I wonder what he’s done to the tent”, next I heard HELP from Ray and when I went out, the marquee was actually on the roof of the house, nowhere near the Landrover and Ray was holding onto it for all he was worth. Somehow we managed to rescue it and when Ray recounted the story to Bruce, he stated that they quite often get small swirls of wind that act just like mini tornadoes. A warning would have been good. A tiny vole - about 2" long. Over a weekend we attended the Welsh National Dog show at Builth. Bruce and Lyn enterted Charlie, a white Siberian Husky. He came second in his class. Charlie telling me how he was robbed of first place. We were with them on Friday 26th when they went to collect their new husky puppy. He is absolutely gorgeous and I’m sure will become a champion show dog. We finally left these good people to their own lives again, and decided that my Mum and Dad must be missing us by now, so here we are again, in bonny Scotland. We are hoping that Lizzie will meet her new owner very soon and then with a bit of luck, we are off to Scandinavia.